GPAR » August 2018 – The lovely Lina! August 2018 - The lovely Lina! August 2018 – The lovely Lina! We think Lina was born in April 2016 so she is about two years old now and she came into the refuge in July 2016. 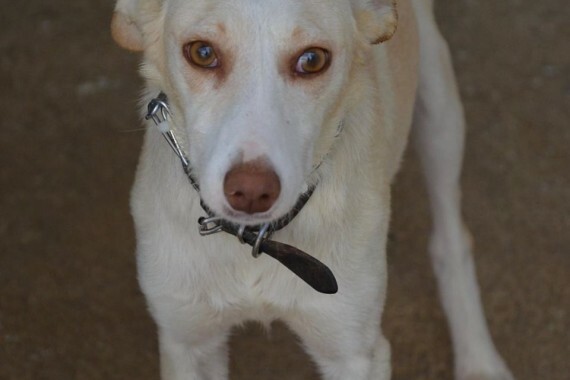 LINA is a stunning Labrador X Podenco with the best looks of both breeds.. She has a wonderful white and sandy coloured coat and such a pretty face. Another gorgeous girl who would make some family very happy. Lina was incredibly shy when she arrived at the refuge with her brother PAU. She was very frightened of people, but with regular meals and the friendly and patient volunteers, she has come out of her shell and is learning to make friends with humans. She goes out for regular walks with our brilliant volunteers and is learning to ask for affection from them. She needs to build on her confidence with a patient family to be the perfect pet we know she can be. We think she should live with another dog in the home so she can learn the ropes from him or her. LINA is a beautiful dogs and in need of a better life. The refuge is a safe and secure place for her but it is no substitute for a loving home so if you think you would like to be her new family, please send us an email at gparadopt@gmail.com. Please share and make a donation if you can.